Tìrlicko is southeast of Havirov, near the Polish border. On this website it is named Cierlicko (that's Polish, I guess). 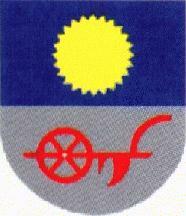 Here is the coat of arms with a many-rayed sun. The flag was adopted 12 Feb 1992. Tìrlicko has a population of ca.4 000): It is situated 9 km W from Èeský Tì¹ín on a bank of Tìrlicko Dam Lake and it is a recreation resort for Ostrava agglomeration. "Cierlicko" is its Polish name - there is a strong Polish population there. Tìrlicko: the original Petr Exner's image is erroneous (he has corrected it later) - the flag is blue with a yellow sun but the sun image is different (similar to or identical with that used in Tìrlicko website.